Imagine that a student signed up for a video streaming subscription, a service that costs $9.00 a month to enjoy binge-worthy television and movies at any time of day. A few months into her subscription, she receives a notification that the monthly price will be increasing to $12.00 a month, which is over a 30 percent price increase! The student can either continue with her subscription at the higher price of $12.00 per month or cancel the subscription and use the $12.00 elsewhere. What should the student do? Perhaps she’s willing to pay $12.00 or more in order to access and enjoy the shows and movies that the streaming service provides, but will all other customers react in the same way? It is likely that some customers of the streaming service will cancel their subscription as a result of the increased price, while others are able and willing to pay the higher rate. The relationship between the price of goods or services and the quantity of goods or services purchased is the focus of today’s module. This module will explore the market forces that influence the price of raw, agricultural commodities. To understand what influences the price of commodities, it’s essential to understand a foundational principle of economics, the law of supply and demand. Understand the law of supply and demand. Supply is the quantity of a product that a seller is willing to sell at a given price. The law of supply states that, all else equal, an increase in price results in an increase in the quantity supplied. Imagine a bakery that produces and sells cookies. The law of supply states that the baker is willing to increase production and sell more cookies if the price he can sell the cookies for increases. Thus, he is willing to produce more cookies if they can be sold for $3.00 than if they are sold for $0.75. This relationship between price and quantity is modeled below. The supply curve demonstrates that as price increases, the quantity supplied increases. Alternatively, as the price decreases, the quantity supplied decreases. A positive relationship exists between price and quantity when it comes to the supply curve. Farmers and ranchers respond to price changes in the same way. If the price of grain is lower, producers may wait to sell their grain and keep it in storage, reducing the supply that is in the market. If the price of feeder cattle is low, a cow/calf producer may feed his calves an extra few months, waiting for the price to improve. However, if the price of these commodities are high, producers are willing to sell a greater quantity of their commodity to the market. Producers make the decision of whether or not to supply their commodity to the market at a particular price, but there are external factors that determine the total supply, or quantity of agricultural goods in the market. With a classmate, name three factors that contribute to the total supply of an agricultural commodity. When these factors are large enough, the supply curve will shift. If, for example, a new hybrid of seed is developed that substantially increases the yield of corn, the supply of corn will shift to the right, as seen in Figure 7.1. Alternatively, if there is a severe drought, and yield drops significantly, the supply of corn decreases. This will cause the supply curve to shift to the left, as seen in Figure 7.2. Demand is the quantity of a product that a buyer is willing and able to purchase at a given price. The law of demand states that, all else equal, as the price of a good or service increases, consumer demand for the good or service will decrease. Now, think about a consumer who is in the market to buy cookies from a bakery. The law of demand suggests that the consumer will purchase more cookies as the price for cookies decreases. Further, the consumer will purchase fewer cookies as the price increases. Thus, a consumer is willing and able to purchase fewer cookies if they cost $3.00 than if they only cost $0.75. The demand curve is downward sloping. 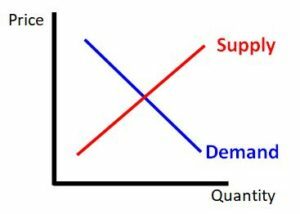 The demand curve charted below demonstrates that as price increases, the quantity demanded decreases. Alternatively, as the price decreases, the quantity demanded increases. An inverse relationship exists between price and quantity when it comes to the demand curve. Demand for an agricultural commodity is derived from final consumers. Think about the many final consumer products that are made from agricultural commodities! Whether it’s corn or wheat in cereal and other food products, ethanol in gasoline, or meat products, final consumers will ultimately influence the demand for agricultural commodities. When factors of demand are large enough to influence the total demand for a good, the demand curve will shift. If the world population grows over the next decade, the demand for most food products will increase and shift to the right, as seen in Figure 7.3. Alternatively, if an economic recession hits and household income decreases, the demand for relatively expensive food products, such as beef, will decrease. This will cause the supply curve to shift to the left, as seen in Figure 7.4. Weather is one of the primary factors that influences the supply of a commodity. Weather conditions during the growing season such as drought, hail, or wind will have an impact on the supply of a commodity. If the Midwest is experiencing a particularly dry growing season, the supply of crops grown in this region will decrease. For livestock, significant heat can cause heat stress or exhaustion among cattle and can lead to higher death loss, decreasing supply. Additionally, global weather also influences supply. If South America is experiencing exceptional weather and has a strong crop, the quantity supplied to the global market will increase, influencing U.S. markets. The amount that a producer is able to produce, or yield, directly affects supply. As the yield of a commodity increases, the supply increases. To calculate the total production of a commodity, multiply the number of acres in production and the yield in bushels or tonnage produced per acre. Yield is influenced by other factors such as weather, soil fertility, and technology. A disease outbreak will decrease the supply of livestock. In recent history, the U.S. has experienced outbreaks that have affected the supply of pork and poultry. For example, the outbreak of Avian Flu significantly decreased the supply of laying hens. Disease can have a major impact on the domestic supply of livestock. Improvements to technology increases the production of a product. Think about the impact that research and development of seed hybrids have had in the yield of crops, for example. Seed developed to withstand disease or custom applying fertilizer are two examples where technology has led to increased efficiency and productivity in the field. As technology evolves, the yield and supply of commodities will continue to increase and become more efficient. The cost of growing a commodity certainly influences the amount that is produced. Input expenses like the cost of land, seed, fertilizer, equipment, and taxes must be considered before growing a commodity. If growing soybeans becomes more profitable than growing corn due to increases in corn input costs, a producer may decrease the number of acres planted to corn. Or, if the cost of feed for cattle or hogs increases substantially, livestock on feed will be reduced. As expenses to produce a particular commodity increases, the supply of that commodity will decrease. The federal and state governments also influence agriculture through policies like trade agreements, farm subsidies, tariffs, property taxes, and conservation programs. Such policies can influence the quantity supplied. For example, through government programs like the Conservation Reserve Program (CRP), farmers can be paid to not plant crops for a certain number of years. The greater number of acres enrolled in CRP will reduce the supply of the commodities normally grown on this land. Government policies also influence the livestock industry. For example, feedlots with over 1,000 head of cattle are required to comply with certain environmental regulations that yards with fewer than 1,000 head are not required to meet. Increased regulation encourages feedlots who are near the 1,000 head capacity to remain below this threshold. The demand for products will increase the more people in the market who want to buy the product. Since agricultural commodities are food products, and everyone needs food to survive, an increase in population will increase the demand for all agricultural commodities and food products. Consumer preferences, habits, and cultural customs will influence the demand for a good. If consumers have a preference for non-GMO food, the demand for non-GMO commodities will increase. If consumers have a preference for grass-fed or free-range meat products, the demand for livestock raised under these practices will increase. Consumer tastes are likely to change over time as they become more sophisticated and other attributes in their life changes, like changes in income. A consumer’s demand for products is influenced by the size of his or her income. An increase in the level of income will increase the demand for goods, because a rise in income will cause an increase in consumption. Think about how much more one would purchase by earning an additional $20,000 per year! For most goods, an increase in income will lead to an increase in consumption and increase demand. The demand for a good can also be influenced by the price of a substitute. Think about meat substitutes. Common protein options for dinner include beef, chicken, pork, or fish. These products can easily be substituted for each other, so the price of competing products can influence demand of another. For example, if the price of beef increases, consumers may choose to purchase more chicken instead. This would increase the demand for chicken and decrease the demand for beef. Research findings and media sources can also influence demand. If research findings are reported and heavily shared with the public, it could have a large impact on demand for particular goods. For example, if a well-publicized study concludes that 6 ounces of beef consumption per day increases your chance of heart disease by 50 percent, the report is likely to have a large impact on the demand for beef. Government policies and activities also influence the demand for goods. Take ethanol, for example. If the government requires that gasoline must contain a certain percentage of ethanol in an effort to reduce carbon emissions, the demand for corn will increase in order to comply with the government regulation. The government can also increase demand by functioning as a consumer and purchasing agricultural products. In the past, the federal government has purchased excess grain inventories, as well as excess milk to dehydrate and turn into powdered milk in the event of a national emergency. International markets influence the demand for U.S. commodities. 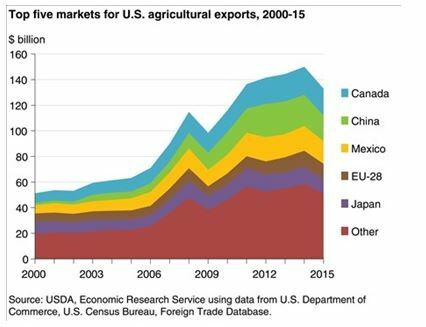 The U.S. produces more agricultural products than the country can consume each year, which creates a surplus. This allows the U.S. to export a percentage of its production abroad. Negotiating trade agreements increases demand for U.S. commodities. In fact, exports account for about 15 – 20 percent of the total corn and soybean crop alone. Other coarse grain exports can vary annually from 12 – 25 percent of total U.S. production. International commodity markets can also influence the demand for U.S. commodities. For example, if South America grows more acres of soybeans, the supply of soybeans in South America will increase, leading to a decrease in price for South American soybeans. If soybeans are less expensive in South America, other countries, such as China, will end up purchasing more soybeans from South America, decreasing the demand for U.S. soybeans. Price discovery is the process used to determine prices for a good based on conditions affecting supply and demand. When the supply and demand curve intersect, the market is in equilibrium. This is where the quantity demanded and the quantity supplied are equal. The market is always working to reach equilibrium. The supply and demand curve determine the market price of a good or commodity. If factors of supply or demand lead to shifts in either one of these curves, market prices will change in an effort to work towards equilibrium. The scenarios below demonstrate how shifts in supply and demand will influence the market price. It’s a record year for corn. Weather conditions were perfect and improved seed genetics have enabled producers to achieve a 7 percent increase in yield from last year. Last year, the price of corn in July was $4.30. There has been no major change affecting the demand for corn over the last year. Based on this information, what will happen to the price and quantity of corn? The technology and great weather conditions increase the supply of corn, shifting the supply curve to the right. The new intersection between the shifted supply curve (S2) and the demand curve establish the new equilibrium price and quantity. At this intersection, the price has decreased to $4.00 and the quantity has increased to Q2. There’s a disease outbreak among hogs, causing projected yield to decrease substantially. Last year, the price of hogs in July was $95.00/cwt. There has been no major change affecting the demand for pork over the last year. Based on this information, what will happen to the price and quantity of hogs? The disease outbreak will decrease the supply of hogs, shifting the supply curve to the left. The new intersection between the shifted supply curve (S2) and the demand curve establish the new equilibrium price and quantity. At this intersection, the price has increased to $110.00/cwt and the quantity has decreased to Q2. The U.S. government recently negotiated a new trade deal with countries in the Pacific, creating new markets for American agriculture. Last year, the price of live cattle averaged $105/cwt. There has been no major change affecting the supply of beef over the last year. Based on this information, what will happen to the price and quantity of live cattle? Access to new markets will stimulate an increase in demand of live cattle, shifting the demand curve to the right. The new intersection between the shifted demand curve (D2) and the supply curve establish the new equilibrium price and quantity. At this intersection, the price has increased to $110/cwt and the quantity has increased to Q2. Ethanol production has slowed dramatically because it’s no longer being subsidized and margins are tight. Prior to this, corn averaged $4.00. There has been no major change affecting the supply for corn over the last year. Based on this information, what will happen to the price and quantity of corn? The slowdown of ethanol production decreases the demand for corn, shifting the demand curve to the left. The new intersection between the shifted demand curve (D2) and the supply curve establish the new equilibrium price and quantity. At this intersection, the price has decreased to $3.70 and the quantity has decreased to Q2. Studying how market supply and demand information impacts commodity prices is known as fundamental analysis. A fundamentalist’s goal is to predict how prices will move as factors of supply and demand change. 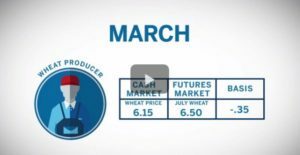 In commodity markets, producers and agribusinesses rely on market reports produced by the United States Department of Agriculture (USDA) to shape expectations about supply and demand conditions for the U.S. and the world. Fundamental analysts keep a careful eye on these reports, and compare supply and demand projections for the coming year to previous years. The monthly WASDE Report, Crop Production Annual Summary, Prospective Plantings, Acreage Report, Crop Progress, Cattle on Feed, and Hogs and Pigs are key, market-moving reports that are released throughout the year. These reports are discussed below. 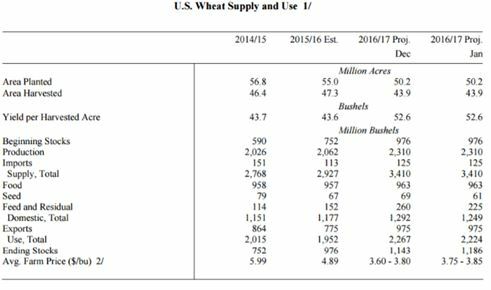 The World Agriculture Supply & Demand Expectations (WASDE) report is prepared monthly and includes forecasts for U.S. and world supply and usage for crops and oilseeds such as wheat, rice, corn, barley, sorghum, oats, soybeans, and cotton. Additionally, U.S. coverage of the WASDE report includes sugar, meat, poultry, eggs, and milk. Crop Production includes two components. 1) Areas harvested, and 2) Yield per acre. To calculate production for a given year, multiply the area harvested and yield per acre. Supply also takes into account Beginning Stocks. Beginning Stocks, also known as carryover, is the amount of a commodity left over from the previous production year that is carried over into the coming year. Thus, beginning stocks in 2018 is equal to ending stocks in 2017. Beginning stocks is calculated by taking the difference between Total Supply and Total Use from the previous year. Imports is the amount of a commodity brought into the country from abroad. Take a look at a wheat supply example from a recent WASDE report. The stocks-to-use ratio is a useful measure of supply and demand for a commodity. This ratio provides the level of carryover stock as a percentage of the total demand. The stocks-to-use ratio makes it easier to understand the relationship between supply and demand and is easy to compare from one year to the next. The stocks-to-use ratio helps to determine if the amount of a commodity supplied is high or low, which will influence market prices. If this ratio is high, it means that production from the previous year is covering a high percentage of future demand, even before the new crop is grown. A high ratio indicates a higher supply, causing a drop in prices. Alternatively, if the ratio is low, it means that most of projected demand must be covered by production in the coming year. A low ratio indicates a lower supply, and will cause an increase in the price of the commodity. Some benchmark ratios can be established for crops by looking at historical stocks to use data. On a world basis, a stocks-to-use ratio for corn under 12 percent has led to stronger prices. For soybeans, the level is below 10 percent, and below 20 percent for wheat. Below is a graph that plots the stocks-to-use ratio from 1978-2016 for corn. The second graph plots the average price for corn over the same time period. Notice that when the stocks-to-use ratio is high, prices are lower, and when the ratio is low, prices are higher. Another way to interpret the supply of a commodity is to look at Days of Supply. Days of Supply shows how long the current supply can sustain existing demand. 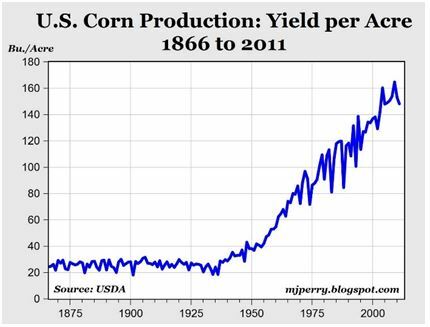 Below is a graph that plots the Days of Supply for corn from 1978-2016. The second graph plots the average price for corn over the same time period. Notice that when the Days of Supply is high, prices are lower, and when the Days of Supply is low, prices are higher. The Crop Production Annual Summary reports the actual acres, yield and total production from the previous year. This report provides the final inventory, or ending stocks, from the previous year. This report is released January 12th. Prospective Plantings is released March 31st and estimates the number of acres that are expected to be planted to each commodity. It specifies the planting intentions of producers. Later in the season, the Acreage Report is released on June 30th and reports the number of acres that were actually planted to each commodity, providing a more accurate estimate of production. These three reports of some of the most influential reports to the market. 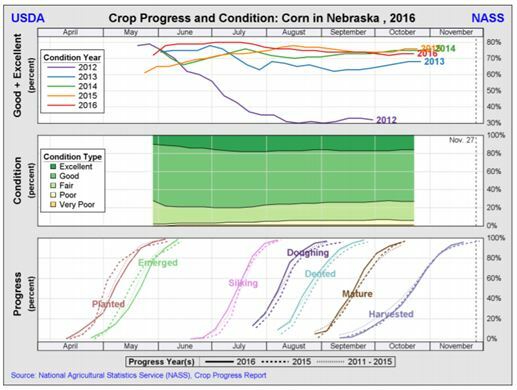 The USDA also releases weekly Crop Progress reports throughout a crop’s growing season. This report describes the condition of the crop, percentage of crop that is planted, and the percentage that is harvested. Fundamental analysis for livestock focuses on projected supply. USDA releases a monthly Cattle on Feed report. The report documents the number of cattle in U.S. feedlots, the number of cattle being placed in feedlots, and the number being marketed for harvest. USDA collects this information by surveying feedlots with a capacity of 1,000 or more head. This report provides a short-term outlook for beef supply coming to market, and can also impact input markets, such as corn, that is fed to livestock. Cattle on feed are steers and heifers being fed a ration of grain, silage, hay and/or protein supplement for slaughter market that are expected to produce a carcass that will grade select or better. It excludes cattle being “backgrounded only” for later sale as feeders or later placement in another feedlot. Placements are steers and heifers put into a feedlot, fed a ration which will produce a carcass that will grade select or better, and are intended for the slaughter market. Marketings are steers and heifers shipped out of feedlots to a slaughter market. The USDA releases the Hogs and Pigs report quarterly to provide information on the inventory of hogs in the U.S. This report includes the inventory by class and weight groups, and the number of hogs that went to market and those kept for breeding. Consumers have many variables to consider before making large purchases like a car or home. An individual purchasing a car is likely to consider the car’s price, fuel economy, overall quality, and if the car generally meets his or her current and future needs. These are a handful of the many items an individual takes into account before making a $15,000+ purchase. Now imagine making a decision worth well over $350,000 every year! This is the approximate value of raising corn on 500 acres of land. Just like consumers who make purchasing decisions, agricultural producers have multiple variables to consider when selling their crops and livestock. Some of these considerations include when to sell their production (i.e., before it is harvested, at harvest, or storing the grain to sell at a later date), when the operation needs cash to pay its bills, and what type of contract to use with the local buyer. These decisions have serious financial implications, and can make a difference on whether or not the producer generates a profit in the production year. It is important for producers to make marketing decisions that best fit the needs and goals of their operation. The following four modules will explore the choices that producers have in selling their physical commodity to buyers in the local, cash market. This module will focus on the most common contracts: a cash and forward cash sale. A producer’s primary goal in raising crops or livestock is to generate a profit. Even though commodity prices are changing throughout the production year, producers have some choices on how they will market, or sell, their crops and livestock. The most common type of transaction for crops and livestock is a cash contract. A cash sale is a type of contract where a good is exchanged for a payment simultaneously. In a cash sale, the producer, or the seller, delivers the product to the buyer and receives money on the same day. Everyone can relate to this type of sale, as most purchases are made with this type of transaction. For example, a grocery store sells food to customers and receives money at the same time. What’s unique to commodity markets is that producers, the initial sellers of commodities, are price-takers. A price-taker accepts the price that a buyer is willing to pay. More specifically, a buyer of corn, such as a grain elevator, will post the price they’re willing to pay for corn on a given day. The producer can choose to sell at this price or wait to sell in hopes that the buyer’s price will increase in the future. The cash price is the price a buyer is willing to pay for a good. The cash price is also known as the “spot price”. The spot price is the price received today and today only. Recall that cash price is calculated by adding the commodity’s futures price and basis. For commodities that are not traded on a futures exchange, the cash price is determined by local supply and demand. Producers who raise crops will search online or call local buyers to get the current cash bid. Cash bids communicate what the buyer is willing to pay for the commodity across various delivery periods. If a producer finds a bid online, he or she should call and confirm the cash price before hauling grain to the buyer. AgWeb.com is a helpful website that displays cash bids for several buyers in a geographic area. A cash sale is also how livestock are sold. For livestock, the cash price is determined at the point of sale. Cattle and hogs can be sold directly to another producer, at a livestock auction, or through an order buyer. Fat cattle are sold directly to meat processors. When selling directly to a buyer, rather than at an auction, livestock producers will negotiate and agree upon a purchase price for the livestock with the buyer. Weight: The price per hundredweight (cwt) will change as the weight of the animal increases. While heavier animals will overall sell for a higher dollar amount per head, the price per cwt decreases as the weight of the animal increases. Gender: Heifers tend to sell for about $10 per cwt less than steers. Genetics: The breed and genetics of livestock can be an indication of the quality of the livestock. Yield and Grade: Premiums or discounts can occur based on yield and grade – or quality – of a carcass. It’s October 10th and Shelby is harvesting her corn. She doesn’t have enough bins on her farm to store all of her corn, and she is needing cash to pay off her operating loan coming due. The nearby futures price (DEC) is $3.78 and basis is -0.28. Shelby decides the current cash bid of $3.50 at the local grain elevator is fair, so she delivers and sells 5,000 bushels today. It’s October 20th and Steven is ready to sell 100 head of feeder calves that weigh an average of 700 lbs. November Feeder Cattle Futures Price is currently $125/cwt, and his calves generally sell for $5.00/cwt above the futures price. Steven is comfortable with these prices and hauls his feeder calves to the local livestock auction. A forward cash contract is an agreement where the price and quantity of the good is set between the buyer and seller for delivery in the future. A forward cash contract locks in the cash price the seller will receive and the buyer will pay for the commodity. However, delivery of the commodity does not occur until a date in the future. A forward cash contract requires physical delivery of the commodity. It is common for producers to use forward cash contracts when marketing their grain. Producers use cash bids provided by local buyers to establish a forward cash contract price. Based on these bids, if a producer delivers his or her soybeans in October or November they will receive a cash price per bushel of $9.52. Notice that the sum of the futures price and basis is equal to the cash price ($10.02 + -0.50=$9.52). Using a forward cash contract, the producer can lock-in the price of $9.52 and wait to deliver in October when he or she harvests the beans. By forward contracting, the producer is not affected if the price of soybeans decreases, but the producer will also not benefit if the price for soybeans increases. There is some risk associated with forward contracting before the producer knows whether or not production is high enough to meet the contract quantity, as the producer is expected to deliver the contracted quantity to the buyer. Forward cash contracts can also be utilized by livestock producers. This is most typical when selling directly to a local buyer like a backgrounding operation, feedlot operation, or processing facility. It’s June 10th and the price of soybeans has been increasing. Paul, who grows soybeans, wants to take advantage of this high price as he believes it will be lower by harvest. Paul calls his local grain merchandiser to learn about forward contracting options on new crop. Paul wants to deliver upon harvest in October, making the nearby futures month November. The futures price for November soybeans is currently $11.00. Basis for October delivery is set at -0.55. Paul decides to forward contract 3,000 bushels of soybeans at a cash price of $10.45 for October delivery. It’s April 1st and the price of fed steers is above average. Anne, a feedlot manager, wants to forward contract 500 head of steers that will be finished in June. She calls the buyer at the nearby beef processing facility to establish a forward contract for June delivery. Using the June Live Cattle futures price of $115/cwt and estimated basis of +2.00/cwt, Anne locks in a price of $117/cwt for 500 head of fat cattle for June delivery. Who makes a higher salary? A mechanical engineer in Los Angeles, California or a mechanical engineer in Ames, Iowa – assuming their job responsibilities, education, and experience is all equal? Why do you think this is true? It is common for the salary of a similar job to differ based upon where an individual lives. While an engineer in LA may generate a higher salary than one in the Midwest, the engineer in LA is also going to experience a higher cost of living. Generally, an area’s cost of living and local demand for individuals in a particular career field affects the wages received in that area. A similar concept applies to the cash price offered to agricultural producers. A corn producer near the Mississippi River is likely to sell corn for a higher price than a producer in central Nebraska. While both producers experience the same futures price, these producers face a different basis level. Basis is different across geographic locations and is influenced by the costs incurred to move the commodity to the next point in the supply chain. This module dives deeper into the concept of basis, what factors affect the basis level, and explores a contract offered in the cash market for producers to lock-in a favorable basis level. The relationship of the local cash market price and futures market price is called basis. Basis is calculated by subtracting the futures price from the local cash price and can be positive or negative. Basis varies from one buyer to the next because it is set by the local grain buyer, and often differs across geographic location. The basis level can make a big difference on whether or not producers decide to contract their grain with a particular buyer. Negative basis indicates a low local demand for the commodity. When basis is negative, the local cash price is less than the futures price. Basis is often negative for grains. Positive basis indicates a high local demand for the commodity. When basis is positive, the local cash price is higher than the futures price. Basis is often positive for livestock, but is less common for grains. Two common terms to describe changes in basis are strengthening and weakening. 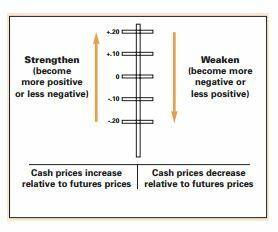 Strengthening basis is when basis becomes more positive, or the cash price increases relative to the futures price. Strengthening basis is good for the producer selling the commodity. Weakening basis is when basis becomes less positive, or the cash price decreases relative to the futures price. Weakening basis is not helpful for the producer selling the commodity. The chart below helps visualize the changes in basis. Local Supply: Basis is typically stronger in a given location when the available supply is scarce relative to demand. For instance, light selling in the spring will tend to strengthen basis. Alternatively, basis is generally weaker when an area is experiencing abundant production and availability of the commodity. This is often the case around harvest, when basis levels tend to be weaker because there is a large supply available to the market. Local Demand: Basis will strengthen in a given location when the demand is strong relative to supply. For example, if a grain elevator has a railcar to fill and needs more grain to fill it, basis will strengthen. Alternatively, if demand is weak compared to local supply, basis is likely to widen. Transportation costs: The cost of transporting a crop can affect basis. Moving grain from point A to B costs money and long hauls are expensive. The greater the transportation costs, the weaker the basis. The buyer of the grain, who sets basis, will widen basis the more expensive it is for them to transport the grain to a processor. Therefore, basis tends to be more favorable at grain processing facilities, terminal elevators, and shipping points on major rivers compared to grain elevators in remote locations. This means that producers who are further away from areas where grain is used or exported may be at a disadvantage due to the cost of transporting the commodity. Interest and storage costs: When it becomes more costly for the grain buyer to store grain due to interest and storage costs, basis levels will weaken. Profit of Buyer: The grain buyer controls the price they pay for corn by controlling the basis level. Ultimately, the buyer will set a basis level that is profitable for the buyer. Stronger basis levels will encourage producers to move their grain and sell to a buyer with a more attractive basis level, but the buyer will always work to maintain a basis level that is profitable for their business. Unlike grain, livestock basis is not posted or tracked daily. For sellers of livestock, it is important to have an understanding of historical basis levels in order to estimate the cash selling price. While grain basis can be computed using deferred futures months, livestock basis is always calculated using the nearby (closest to expiration) futures contract because livestock cannot be stored. Local Supply & Demand: Basis can also be influenced by local supply and demand. If there is harsh winter locally, it can delay how soon cattle are ready for market in the local market. This local delay in supply can have a positive impact on basis (and prices) received locally. Seasonal Price Patterns: Basis for livestock is not constant throughout the year. It is largely dependent upon seasonal patterns due to the timing of production. For example, the majority of the U.S. beef cow herd is on a spring calving system. This results in the greatest supply of calves in the fall. The increase in supply results in weaker basis levels. When these calves are placed in feedlots, they are generally ready for harvest in mid-to late summer. Thus, basis for fed cattle tends to be weakest during this time of year. Transportation Costs: The cost of transporting livestock to the end-user or processor can also affect livestock basis. Moving a commodity from one location to another costs money and long hauls are expensive. The greater the transportation costs, the weaker the basis. A basis contract is a contract provided in the cash market where the seller of grain establishes the basis portion of the cash price for a specific delivery time and quantity. The futures price is set at a later date. A basis contract allows producers to lock-in a basis level for a specific delivery period while waiting to set the futures price at a later date. The producer assumes the price risk until a futures price is locked in. Note that a basis contract is a common crop transaction, but is rarely used for livestock. A producer will use a basis contract when the local buyer’s basis levels are stronger than normal and the producer anticipates an increase in the futures price of the commodity. Take a look at the following cash bids for corn. In a basis contract, a producer will lock-in basis for a date of delivery. If a producer wants to contract 10,000 bushels of corn for October delivery, the producer will lock-in basis for the October delivery range. In this example, the producer locks-in a basis level of -0.40. The producer leaves the futures price open, in hopes that futures will improve by the time the December futures contract expires. Pat raises corn and watches basis at the local grain elevator closely. On June 1st, Pat sees that basis for October delivery is stronger than normal at -0.20, likely due to the dry weather conditions. Pat contracts 5,000 bushels of corn with a basis contract for October delivery. December corn futures rally in early August to $5.00 per bushel. Pat decides to set this futures price for his basis contract. Pat delivers his corn on October 15th for a cash price of $4.80. Sydney grows and sells soybeans. She knows that basis is historically wide around harvest. She has on-farm storage available, which enables her to store her beans and sell and deliver when prices are more favorable. Sydney sees that basis for next March is -0.25. Sydney believes this basis level is favorable, so she contracts 5,000 bushels of soybeans using a basis contract on June 1st. As the production year continues, Sydney watches March soybean futures. Soybean markets rally in late July, and Sydney locks-in a futures price of $11.20 on July 25th. Sydney stores her beans after harvest and delivers to the buyer on March 1st at a cash price of $10.95.